More and more, it seems that the revolt that mobilized against the Muslim Brotherhood was manipulated by the powers-that-be. It’s looking more and more like the “popular uprising” that demanded the ouster of the Muslim Brotherhood’s Mohammed Morsi in Egypt was ginned up by Egypt’s establishment, including the military. That’s not too surprising, but it does mean that the fractious civilian, anti-Islamist movement—including quarreling secular forces, liberals, youth and women—had better unite quickly to demand that the military step back from power. The young activists behind the protests that led to last week’s military overthrow of President Mohamed Morsi fear they once again may be overshadowed by other political forces as Egypt stitches together a coalition government ahead of new elections.… They may now find—as they did in 2011—that the youth’s street power can’t easily be turned into political capital. Mr. Sawiris, one of Egypt’s richest men and a titan of the old establishment, said Wednesday that he had supported an upstart group called “tamarrod,” Arabic for “rebellion,” that led a petition drive seeking Mr. Morsi’s ouster. He donated use of the nationwide offices and infrastructure of the political party he built, the Free Egyptians. He provided publicity through his popular television network and his major interest in Egypt’s largest private newspaper. He even commissioned the production of a popular music video that played heavily on his network. The streets seethe with protests and government ministers are on the run or in jail, but since the military ousted President Mohamed Morsi, life has somehow gotten better for many people across Egypt: Gas lines have disappeared, power cuts have stopped and the police have returned to the street. The new military-led government accused Mohamed Morsi and his allies in the Muslim Brotherhood on Wednesday of a campaign to incite violence against their foes before and after his ouster as president, offering a new explanation for the week-old takeover and hinting that the group might be banned once again. Since Egypt’s military overthrew President Mohammed Morsi last week, the job of trying to coax the Egyptian military to restore order and democracy in ways that satisfy Washington’s standards has largely fallen to newly minted Defense Secretary Chuck Hagel. But the current crisis has exposed the limits of the military relationship. The army overthrew Egypt’s first democratically elected president despite US objections, which were conveyed privately by Mr. Hagel and Gen. Martin Dempsey, chairman of the Joint Chiefs of Staff, US officials said. The US is moving ahead with plans to deliver four F-16s to Egypt despite the ongoing debate about the military’s overthrow of President Mohammed Morsi and whether it legally constitutes a coup that could shut off aid to the country. Defense officials say senior administration leaders discussed the delivery and decided to let it continue. Kuwait will deposit $2 billion with the Egyptian central bank, give a $1 billion grant and offer $1 billion worth of oil and oil products, state-run Kuna said in a text message today. Saudi Arabia and the U.A.E. pledged $5 billion and $3 billion respectively yesterday. The money from the Gulf Arab kleptocracies means that Egypt doesn’t have to worry if the United States cuts off aid. 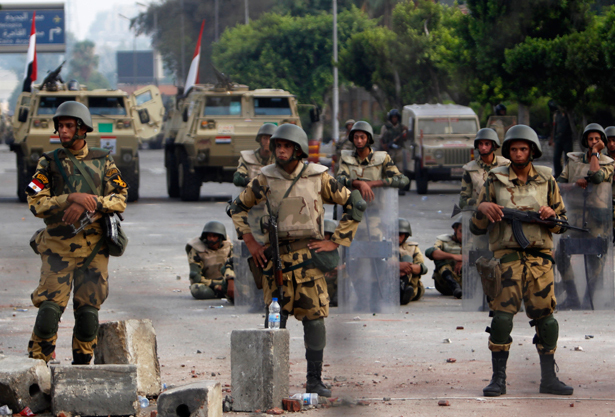 For more on the situation in Egypt, read Sharif Kouddous’s latest dispatch.